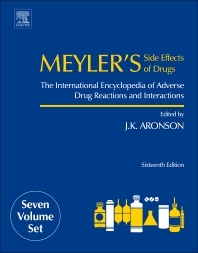 Meyler's Side Effects of Drugs: The International Encyclopedia of Adverse Drug Reactions and Interactions, Sixteenth Edition builds on the success of the 15 previous editions, providing an extensively reorganized and expanded resource that now comprises more than 1,500 individual drug articles with the most complete coverage of adverse reactions and interactions found anywhere. Each article contains detailed and authoritative information about the adverse effects of each drug, with comprehensive references to the primary literature, making this a must–have reference work for any academic or medical library, pharmacologist, regulatory organization, hospital dispensary, or pharmaceutical company. The online version of the book provides an unparalleled depth of coverage and functionality by offering convenient desktop access and enhanced features such as increased searchability, extensive internal cross-linking, and fully downloadable and printable full-text, HTML or PDF articles.